Several months had passed since I had been able to escape the office. My mind was swimming in chaos, unable to keep everything straight, all the balls in the air so to speak. There was a time when the daily challenges of my job drove me to accomplish many things. What I didn’t understand at the time is the effect that the drama, stress, and chaos would have on me long term. The toll that the chaos of life has on your mental energy, your patience and your outlook over a life time is all too often understated. These days I much prefer to escape the stress as often as possible. It relaxes me and makes me much better at my job, a better father, husband and person. I prefer the simple silence of the wind whispering it’s way across the prairie, the trickling of a mountain stream, and the song of a chickadee early in the morning. So when the construction season ended, I jumped at the chance to escape into the mountains. Some of you may consider a two day drive and a trek into the frozen mountains of Yellowstone in the middle of the winter with just my show shoes, a foolish adventure. What I discovered may change your mind? As the morning sky started to glow over the mountain tops, I strapped on my snow shoes, the snow noisily crunching beneath my weight. The frigid night was evident all around me. The stream in the valley cast a fog skyward, as if on fire. Frosty branches cracked noisily adding to the symphony of wondrous sounds. I closed my eyes in silent prayer to thank God for the coming day, eyes to clearly see his majesty in the mountains around me and ears to hear his whispers. I was really praying for a clear mind, for him to remove the stress and chaos that tends to fill my days, the stress that I had come to Yellowstone in the dead of winter to escape. In the back of my mind I could hear my dad saying “No matter where you go there you are!” The words flashing through my memory as I took the first few steps into the valley. “Then maybe I am here to lose myself!” I thought angrily. My lungs burned as they icy air filled them, painful at first, but exhilarating as I pressed on, my destination unknown. I slowly worked my way over the first hill, drawn to the foggy valley. The brutally cold air made each foot step a clashing of symbols for all to hear. “I will never see anything at this rate” I thought frustratingly. Mid way down the hill a small ravine split off to my left, the sunlight streaking across it. The valley was warming slightly as the sun peered over the peaks to my east. The sound beneath my snowshoes quieted to a gentle swish as the sun warmed the snow slowly. As I approached the ravine, a small herd of elk appeared on the near-by ridge. Seven or eight young bulls had taken refuge from the icy wind in the tree cover during the night. Since the reintroduction of the grey wolf, the elk have become much more skittish. Even these healthy bulls are wary of my presence. In recent years the elk seem to spend more time in the cover of the lodge pole pines until dark, rather than in search of grass in the valleys. This small group of bulls seems satisfied that I am harmless and begin to feed on the wind-blown ridge where the snow isn’t as deep. My legs are loosening up a bit and the going is easier as I drop into the valley. The frost is glistening in the morning sun as I stop to soak up the warmth of the rays. The gentle trickle of a stream fills the air, but it is still cloaked in morning fog. An eerie chill blows through the valley as the warmth of the sun quickly disappears. The snow is deeper in the valley and my legs strain to make progress. No wonder the elk stick to the ridges and hillsides. Off to my west, a small group of big horn sheep cling to the rocky hillside. They pay no attention to me as I approach through the deep snow below them, secure in their ability to cling to the cliffs for protection. Several rams and two ewes easily navigate the steep hillside in search of grassy tufts for breakfast. The rams occasionally stop for a boastful pose to their competition to be followed by a swift kick to the underside to test their will. The ewes feed on, leaving the testosterone-filled rams to themselves. I move on, working my way towards the sound of the stream, stopping periodically to check my bearings. Navigating solely by sound as the fog has enveloped the entire valley now. The symphony of the small stream is all around me now and I am confused for a moment. I have walked into an oxbow without managing to catch a glimpse of the stream. As I stop to listen, a new sound adds to the mystery through the heavy morning fog. It sounds like snow shoveling. How can that be? I am now miles from anyone……but not alone. I take a few cautious steps towards the direction of the mysterious sounds and the long guttural grunt gives away its source. A large bull bison is spending his morning in search of the valley’s grasses. His massive head swinging back and forth, pushing aside the soft snow like a bulldozer. “Seems like a lot of work for a few mouthfuls of dead grass” I think to myself. 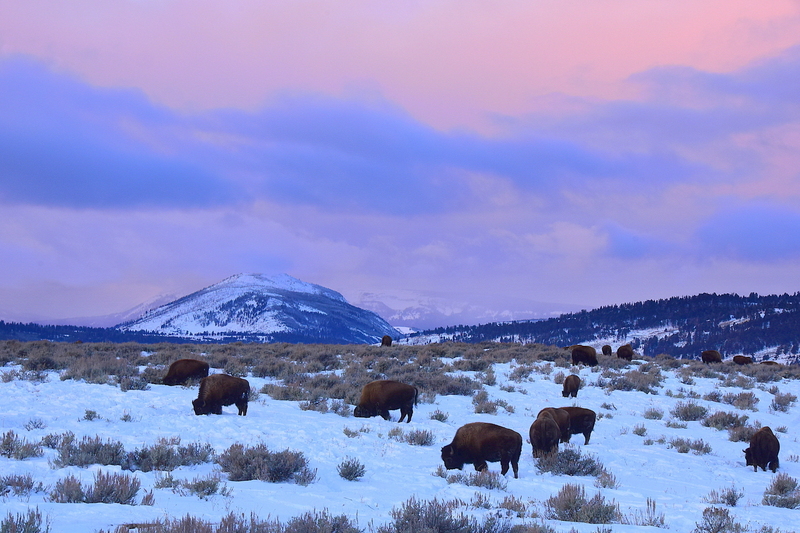 But that is the life of a Yellowstone bison, a hard life, but a wild life. The bulls live mostly a solitary existence, roaming the hills and grasslands of Yellowstone, spending only a few weeks each summer with the rest of the herd to compete for mates. I can see him now, barely 30 yards from me, swinging his massive head back and forth, oblivious to the chaotic world around him, focused on the grumbling in his belly. I cross the small stream, heading away from the bison, leaving him to his snow relocation project, my mind straining to free itself from its own stress-filled fog. The sun is slowly starting to burn off the early morning fog and the mountainside peeks through the shroud, cloaked in the frosty dress that her creator picked out for her. I stop and stare up at the massive peak, in awe at the splendor of all that surrounds me and amazed at how small I really am. My ears are straining to hear the whispering symphony. It is so quiet. My ears latch on to the sound of the wind through the pine trees, and the trickle of the half-frozen stream. My legs are starting to feel their age, so I slip off my snowshoes and sit down on a flat rock in the sun to drink a cup of warm coffee from my thermos and eat a small sandwich that I had tucked in my day pack. The smell of the coffee fills my nostrils with an intense aroma. I lay back in the snow, close my eyes, and just breathe it all in. The warmth of the rising sun is more powerful than I imagined and adds to the sense of contentment as I sit quietly for what seemed like an hour. The sudden gust of wind brings me back to reality. The clouds are starting to build over the peaks to the west, evidence of the forecasted snow storm, a reminder that I am now five or six miles from the truck. Shortly after my sun-filled nap, I find myself in the middle of a snow squall, intermittent at first with patches of sun between stinging, wind-blown snow crystals, then gradually they give way to a white out. Storms in the mountains are much different than at home. They come and go quicker than I can imagine. At times, I lose sight of the mountain peaks all together. My mind escapes to the bison in the valley, his fight against the snow would get a bit harder now. A couple of hours into my return trip and I am still a few miles from the truck. I am fighting the snow and wind for each step. Luckily the snow is starting to let up and I can see patches of blue sky over the mountains again as I emerge from the woods into a long, sweeping valley. It’s refreshing to be out of the wind for a change and I am not the only one who thinks so. I notice movement in the nearby sage brush. A young coyote sneaks quietly, in search of a meal. He slips in an out of the brush, stopping periodically to listen beneath the snow for any sign of movement. His head turns from side to side, listening intently. He knows I am there, but seems unconcerned with me, focused on his task at hand. And then a change in his routine….. as he crouches and listens more intently. Suddenly he leaps into the air then disappears beneath the snow. My smile widens at what I had just witnessed. The snow covers his entire body for an instant, and when he reappears, his mouth is stuffed with a large shrew which he proceeds to show me proudly. Too much for him to swallow, he chews intently over and over. Several times he tries to swallow it, only to gag it back up and chew some more. It is quite a show and I am overjoyed at how easily I am entertained by this simple show that plays out hundreds of times each day in this winter wonderland. He was gone as quickly as he appeared, slipping silently through the brush in search of dessert, hidden beneath the snow. Across the valley, the trumpets of the orchestra are tuning up. (Ravens) They seemingly delight in playing different tunes all at the same. I wonder what has brought them all together for the show? I pull my binoculars from my pack and stop to watch their performance. A wolf kill lays in the center of their concert. An elk is the latest victim of the pack. The ravens aren’t the only ones celebrating. Two bald eagles sit atop the cottonwood trees, studying the crime scene, waiting for their turn at the table. They cautiously search the tree line for any sign of the wolves, talking back and forth to each other. “What’s for dinner?” “Elk again?” “Do you see any wolves?” “No?” “ Me either.” “Are you going to harass the ravens first or can I?” My imagination gets the best of me during the concert. The symphony seems to go on and on, as I turn my attention back to the return trip. The sun was out again, but not as warm as it was earlier in the day as it slipped lower in the sky. Soon it would fall below the mountains and the valley would cool quickly. The shadows were growing quickly now and stretched across my path. My strides were getting a little shorter, but it felt good to be physically tired. With each breath my lungs were filled with cool, crisp mountain air. As I continued westward, I stopped occasionally to watch a herd of bison feeding above me on a wind-blow slope of the mountainside. A small group of elk fed warily close to the tree line, possibly the same group that lost a member to the jaws of the wolves last night? The low sun revealed a wondrous work of art on the nearby hillside. The dancing shadows of the snow sculpture created by the wind. My eyes scour the hillside for the swirls left behind. Each rock, tuft of grass or tree slowed the wind just enough to shape the snow in a unique way, its creation now casting shadows to finish the work of art. If it weren’t for the long shadows, I would have missed it entirely. I stopped to enjoy the gallery created before me, looking for faces in the snow, I felt like a child again, searching the clouds for animals. It’s true, we really do see things as we are, not as they are. Had I left some of my stress in the valley to play with the bison, coyotes and the elk? I neared the truck just as the sun dipped below the mountains, lighting the clouds near the peaks, one more brilliant show, not to be missed. I thanked God for answering my prayers, for casting my worries away with the wind. As I stood in silence, the wolves returned to their kill. Their lonely calls filled the valley as if God were answering me with his whispers. Thank you to those of you who have taken the time to look, share and comment. The web site is still a work in progress but we’re getting there! Brian Grund….I thoroughly enjoyed your trip through your eyes. God loves you especially, because you GET Him! We humans miss so much and I admire your determination to go out there and find it. Wish I had the resources to do what you do….but you have earned the right. I just have to find God’s wonders in my local lakes, streams…forest…and I’m thankful for every one of them!!! !f Thank you so much for taking the time to share your journey…the narrative is as good as the pictures. Fabulous pictures – I love following you on Facebook. Nube, If you scroll down you will see the “subscribe” box. Simply leave your email address there. Thank you! A wonderful read! I admire your bravery being out there alone. I appreciate all of the kind comments! I’m looking forward to sharing new images, stories and places with you in the coming year! I am especially excited to step out of my box a little on a new project entitled “everyone has a story” which will attempt to share unique stories of people from our adventures! In awe of every picture. One of the most beautiful parts of the day. Gorgeous photos and great commentary to go with them. Thank you foro your kind words Tami! You have a talented eye, wisdom for words, an excellent view on life, family, and God. Keep doing what makes you happy in life. It is time to slow down a little and enjoy what this world has to offer. It looks like you are making the most of it. I have enjoyed your photos and blog. I feel like I am there with you. Thank you for taking the time to let everyone join your journey. Thank you Scott for the kind words and for taking the time to read and comment. I agree that we all need to take the time to slow down and enjoy life a bit more. That was an absolutely beautiful trip, you took me along with your photos and the story. Makes me want to purchase snow shoes and trek out to the hills. Thanks and can’t wait to see and read more. Thank you for taking the time to read and comment Cheryl. I cant wait to hear about your snowshoe adventures! Brian, it is an honor to travel with you through your beautiful images of creation, and your written blogs. When I leave my world and enter yours, it is a time of smiling, relaxing, and enjoying the sights , sounds and scents of creation via your brilliant work. Wouldn’t ever miss a blog of yours! Thank you Rachel. You are always so kind. Thank you again for takiing the time to comment.